Tunnel of Fudge Cake is a cake with a fudge and nut centre baked in a Bundt® pan. It originally required Pillsbury “Double Dutch Fudge Frosting Mix”, which was later discontinued by Pillsbury. In response to widespread complaints, Pillsbury released a revised version that introduced cocoa powder in place of the frosting mix. This revised recipe makes up for the now-extinct ingredient of “Double Dutch Fudge Frosting Mix.” Note that Pillsbury introduced a glaze, whereas the original did not have one. Pillsbury notes that the cake will not work without the called-for amount of nuts. Start heating oven to 350 F / 175 C.
Grease and flour a 12-cup (3 litres) fluted tube cake pan or a 10-inch (25 cm) tube pan. Set aside. In a large bowl, beat the butter and sugar until fluffy. Add eggs one at a time and beat after each one. Add the 2 cups of icing sugar a little at a time, beating after each addition. Stir in flour (if you have been using an electric beater, switch to hand for this) and all remaining ingredients in the cake section. Pour or spoon batter into the prepared cake pan and smooth it out. Pop into oven and bake until edges start to pull away from the pan and the top is set. Don’t go by standard tests such as a dry toothpick test; they won’t work with this cake. The cake should be done in 45 to 50 minutes. Remove cake from oven, leave in pan, and set on wire rack to cool 1 1/2 hours, then invert onto a plate and let cool a further 2 hours. Now, mix all the glaze ingredients. You want the glaze to be runny enough to drizzle, so add a bit more milk if you have to. Drizzle over top, and let some run down the sides of the cake. The cake was created by Ella Rita Helfrich (aka Mrs. Carl J. Helfrich) of Houston, Texas (born approximately 1917.) The recipe won her second prize in the 17th annual Pillsbury Bake-Off, held on Tuesday, 25 January 1966 in San Francisco. She had been participating in the contest since 1959. Though her recipe only won second prize, it was enough to clinch her place in American cooking fame. The first prize recipe from that year has been forgotten. Ella’s, though, was an immediate sensation. The promotion caused Pillsbury’s to be inundated with more than 200,000 requests from people asking where to buy the Bundt pan her recipe called for the cake to be baked in. Ella contained to enter the Bake-Offs after 1966, but never won again. She felt it was owing to her resisting the pressure to go “light and lively” in her recipes. She told reporters there were four major food groups for her: butter, chocolate, pecans and sugar. “You can’t go low-cal when you’re using pecans and brown sugar,” she said in 1999. She liked cooking with pecans, as she had a pecan tree in her backyard. 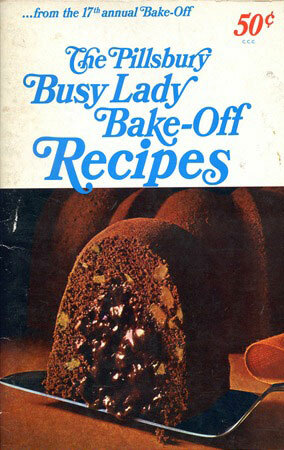 She was still alive in 1999, aged 82.
the recipe book that year. Austin Daily Herald. Austin, Minnesota. Wednesday, 26 January 1966. Mills, Karren. Pillsbury Bake-Off reflects 50 years of American trends. Elyria, Ohio: The Chronicle-Telegram. Wednesday, 2 June 1999. Page C7.